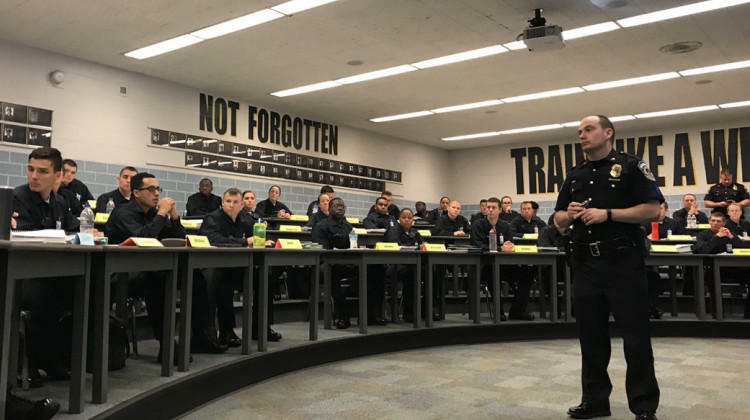 Active IMPD officers are in charge of teaching the implicit bias curriculum to recruits. During part of the training, 53 recruits discussed trust issues underlying that tension. Recruit officer Steven Baumer says communication is key. “If we help people to understand why we are doing what we’re doing, then it’s no longer an authoritative ‘Do this do that, I’m in charge,’” Baumer says. Major Richard Riddle says IMPD plans to implement bias training across the entire department but says pulling active officers off duty is a logistical challenge. He says the curriculum focuses on building a mutual understanding with community members. Riddle says a new class of recruits will receive the training in three weeks.